This article is reprinted with permission of the Chicago Jewish News. Visit www.chicagojewishnews.com. CHICAGO, April 29–The chin is as impressive as ever. The dimpled, heroic, manly, movie-star chin. The Kirk Douglas chin. But while the chin has not changed, clearly the 86-year-old Hollywood icon it belongs to, has. Talking to him is to see a man transformed, one resolved to bring meaning into his life by putting Judaism at the center of it, a man whose sense of spirituality and reconnection with the wellspring of Judaism permeates his art, his family, his very being. This day finds him sitting in the hospitality suite of a downtown Chicago hotel, submitting to the change-interviewers-every-25-minutes ritual that often accompanies a press tour for a new movie. A sandwich and a glass of milk sit, untouched, on a side table; Douglas says he would rather talk than eat. Stars of Kirk Douglas’ magnitude don’t often do such intensive press tours, nor are writers for Jewish newspapers usually invited to them. But this time is different. Douglas requested that the Chicago Jewish News be included in the publicity stop promoting his new movie, It Runs in the Family and, according to publicists, he wanted to do the tour. Kirk Douglas wanted to talk about the movie and he wanted to talk about Judaism. It’s well known from the first volume of his autobiography, The Ragman’s Son, that he experienced a resurgence of interest in his religion after a helicopter crash and, later, a stroke left him partially disabled. He even had a second Bar Mitzvah at the age of 83, and he continues to recommit himself to the richness of the very heritage from which he had been so estranged for so very long. He even makes time to learn Torah every single day. In It Runs in the Family he appears in a role that was adapted slightly to make his character, Mitchell Gromberg, the highly successful patriarch of a Jewish family, a stroke survivor. Douglas had a lot to do with getting Family made in the first place. Although he has appeared in 86 movies in his long career and won three Oscars and numerous other honors, he had never before made a movie with his highly successful actor-producer son Michael, although they have been trying for more than 20 years. After Sept. 11, 2001, which affected both Douglas men deeply, they decided to work harder to find a vehicle they could both appear in. Around the same time, a young screenwriter, Jesse Wigutow, submitted a script to Michael Douglas, with whom he was working on another project. That script eventually became It Runs in the Family. To make it a real-life family affair, Diana Douglas was cast as Mitchell Gromberg’s wife. She and Kirk Douglas were divorced more than 50 years ago, but have remained good friends, and she has had a long career acting in films, theater, and television. Cameron Douglas, the 24-year-old son of Michael Douglas and his first wife, was not an actor but took acting lessons and screen-tested for the part of the third-generation Asher Gromberg. Australian filmmaker Fred Schepisi directed. It Runs in the Family is a warmhearted comedy-drama about a mildly dysfunctional upscale New York Jewish clan. Mitchell Gromberg is a highly successful retired attorney who is not so successful when it comes to communicating with his family. His son, Alex (Michael Douglas) is also a high-powered lawyer who works for the firm his father founded, funneling his frustrated urges toward social activism into a once-a-week volunteer gig at a soup kitchen. Even as he chides his father for his coldness and lack of communication, his own relationships with his wife (Bernadette Peters) and two sons (Cameron Douglas and Rory Culkin) leave much to be desired. The generational tangle begins to come undone at the family’s Passover seder, among other events, and threatens to unravel completely. Finally, various troubles force the Grombergs to confront their own failings as family members and to turn their attention back to nurturing their relationships, however frustrating they may be. 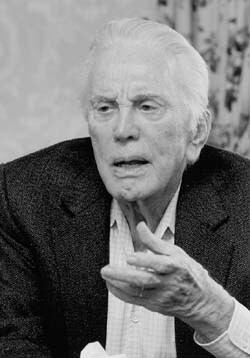 Kirk Douglas says that making the family Jewish was the script writer’s decision, not his, but that everything about the movie, including the Gromberg’s Jewishness, felt right to him. In his 86th year, he says, both family and Judaism are on his mind. Douglas was born Issur Danielovitch, the son of illiterate, poverty-stricken Russian-Jewish immigrants in Amsterdam, N.Y. He worked his way through college as a wrestler and eventually won a scholarship to the American Academy of Dramatic Arts, a move that launched his career on Broadway. Indeed, for a half-century, Douglas was one of Hollywood’s most successful and versatile actors, playing both good guys and bad guys and defying type-casting in such blockbusters as Spartacus, The Bad and the Beautiful, Gunfight at the OK Corral, Paths of Glory, Lonely Are the Brave, Town Without Pity, The Man from Snowy River, and dozens more. Among his notable Jewish-themed films was Cast a Giant Shadow, filmed in Israel and other Middle Eastern locations and released in 1966. In it, Douglas played Col. Mickey Marcus, the American soldier who served as an advisor in the struggle to establish the Jewish state in 1948. Douglas’ character, torn between whether to settle in peacetime America or stay and fight for Israel (a decision complicated by a love triangle involving Angie Dickinson as his wife and Senta Berger as an attractive Israeli soldier), he ultimately dedicates himself to the founding of the Jewish homeland. John Wayne was one of several well-known actors (others were Yul Brynner and Frank Sinatra) who played a cameo role in the film, a tribute to Douglas’ friendship with the legendary tough guy, who usually steered clear of any movies with a too-political message. Douglas played another Jewish character in a lesser-known movie, 1953’s The Juggler, the story of a Holocaust survivor who had lost his Jewishness and finds it again in Israel. Those with long memories might also recall that he helped to destroy the notorious Hollywood blacklist of the McCarthy era when he insisted that blacklisted writer Dalton Trumbo get screen writing credit for Spartacus. Douglas has also produced and directed movies and written nine books, including novels, children’s books and three volumes of his autobiography. He and Diana Douglas divorced in 1951 after having two sons, Michael and Joel. Douglas has two other sons, Eric and Peter, by his wife of 49 years, Anne. All of his sons are involved with the movie business, either acting or producing. It was after a helicopter crash in 1991 that Douglas began finding his way back to Judaism and realizing he may have been wrong in letting the Abraham and Isaac story scare him off. Two young people were killed in the accident and Douglas sustained severe injuries. Over the next four years, Douglas had a pacemaker implanted in his heart and suffered a stroke that left him severely impaired. “When these calamities occurred, I got to exploring the spiritual side of life,” he says. He began studying with Rabbi David Aaron, a Jerusalem Orthodox rabbi, whose Isralight Institute specializes in teaching Judaism to adults. Since then, he says, he has also worked with a number of other rabbis. “I tell people I know more rabbis than Jews,” he says with a grin. Actually, Douglas was known for his philanthropy even before his resurgence of interest in Judaism. His Douglas Foundation has been instrumental in launching a homeless mission and women’s shelter in Los Angeles and funded Harry’s Haven, an Alzheimer’s unit, named after his father, at the Motion Picture Relief Home. The foundation recently committed funds for a theater opposite the Western Wall in Jerusalem. Yet another step signifying Douglas’ return to the source, return to the many facets of his heritage that continue to nourish his life and his work. Dramatic, too, has been the story, the evolution of a man who had turned his back on his roots, only to rediscover and embrace them. And now, with this movie, he offers us an opportunity to share in his heartfelt celebration of Judaism’s glorious treasure. Golda Shira is senior editor and Israel correspondent for the Chicago Jewish News.